House with 4 bedrooms and 4 bathrooms, max. 8 people. In Francolin Close makes you feel right at home. Upstairs is the living room, which opens onto a lovely balcony where you can party until the wee hours enjoying the view and the sound of the rolling sea. There is a large kitchen with dishwasher and everything you need to cook tasty and a bijleuken with washer and dryer and ironing equipment. A parents bedroom, with two balconies. Downstairs are the bedrooms and entertainment room with billiards and table tennis, opening onto a lovely terrace and garden, where you so dive into the pool. For convenience, there is an extra kitchen downstairs and cooling, so you do not have to top each time. The house has an inside- well as an outside braai. Has underfloor heating, intercom, electric gate and ADT security. Great for families, couples or a couple, because there is enough space for privacy. The house is situated at the end of a cul de sac, so very auction for children to play just outside the gate. Behind our house is the Fernkloof Nature Reserve, with more than 40 km. to walk roetes and there is both the novice hiker and the experienced walker imagined. From the mountains you can see how beautiful Hermanus lies with the imposing mountains as a backdrop and the sea as a magnificent view. Golf Location: On loopafsrtand there is a splendid 27 hole golf course. Possibility of private lessons, alswel in groups is possible, just like renting clubs. You can enjoy your meal or just take a nice wine and enjoy the players and the view. Also unique is the cliff walks along the coast, with a variety of birds and fynbos. Vast beaches, ideal for hiking, horseback riding, surfing and boat activities for every age. The Hermanus Wine Route, the southernmost of Africa, bringing top quality and world-renowned wines, accompanied by restaurants for the cursed lovers. Today Hermanus is a popular holiday resort, without losing its charm of fishing village. The bathrooms are all pretty luxurious with o. A stone bath, ample storage space, towel racks, etc. Lovely and spacious accomodation . We loved the property . 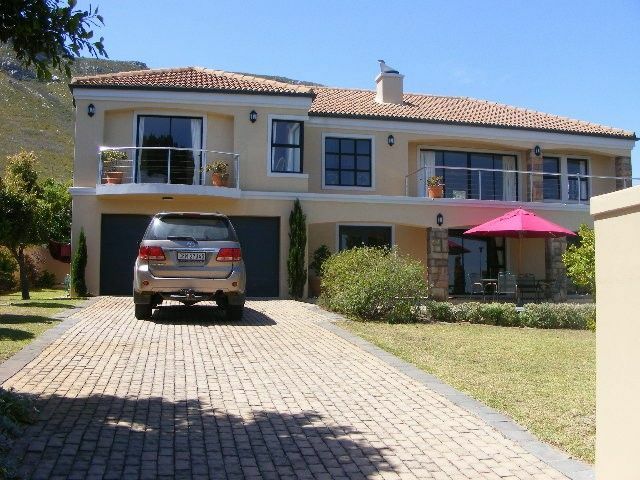 Situated in a quiet cul de sac in a very modern and safe area of Hermanus . The house is spacious - a lovely family home . Hermanus, the ideal place to discover the Western Cape because of its central location. Unique place for the whales, you can almost touch observe as they play with their young. The best time is from June / November. The fynbos, which is unique in the world, behind the house against the mountain and blooms from August / walk to April and is worth more than once. The shop and restaurant happen even meets the cursed guest. Superb 27-hole golf course around the corner within walking distance, too nice to just go have breakfast or grab a lunchje while you watch golf. Diving in a shark cage is also something you should have done once in your life. Unforgettable !! And an hour away from Hermanus. And then the Wine Tour by Heaven and Earth Valley, just outside Hermanus, with the best restaurants and wine tasting in beautiful locations with breathtaking views. Can good competition with Franschhoek and Stellenbosch !! Golf: Stunning 28 hole golf course. nestled between the mountains and the sea, with beautiful panoramic look. Within walking distance from our house. You can also go there to enjoy a nice breakfast or lunch, while watching the golf.